Western blot analysis of extracts from various cell lines using α-Actinin (D6F6) XP® Rabbit mAb (HRP Conjugate). 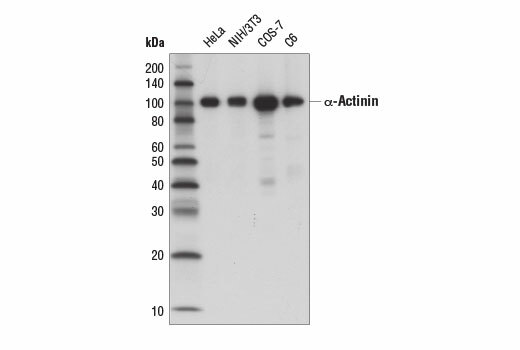 α-Actinin (D6F6) XP® Rabbit mAb (HRP Conjugate) recognizes endogenous levels of total α-actinin protein. Monoclonal antibody is produced by immunizing animals with a synthetic peptide corresponding to residues surrounding Phe316 of human α-actinin protein. This Cell Signaling Technology antibody is conjugated to the carbohydrate groups of horseradish peroxidase (HRP) via its amine groups. The HRP conjugated antibody is expected to exhibit the same species cross-reactivity as the unconjugated α-Actinin (D6F6) XP® Rabbit mAb #6487.
α-Actinin belongs to the spectrin family of cytoskeletal proteins. It was first recognized as an actin cross-linking protein, forming an antiparallel homodimer with an actin binding head at the amino terminus of each monomer. The α-actinin protein interacts with a large number of proteins involved in signaling to the cytoskeleton, including those involved in cellular adhesion, migration, and immune cell targeting (1). The interaction of α-actinin with intercellular adhesion molecule-5 (ICAM-5) helps to promote neurite outgrowth (2). In osteoblasts, interaction of α-actinin with integrins stabilizes focal adhesions and may protect cells from apoptosis (3). The cytoskeletal α-actinin isoforms 1 and 4 (ACTN1, ACTN4) are non-muscle proteins that are present in stress fibers, sites of adhesion and intercellular contacts, filopodia, and lamellipodia. The muscle isoforms 2 and 3 (ACTN2, ACTN3) localize to the Z-discs of striated muscle and to dense bodies and plaques in smooth muscle (1). Nyman-Huttunen, H. et al. (2006) J Cell Sci 119, 3057-66. Triplett, J.W. and Pavalko, F.M. (2006) Am J Physiol Cell Physiol 291, C909-21.